Xeruloid mushrooms comprise a sub-set of the collybioid mushrooms, and can be recognized by their tall and slender stature, their white spore prints and their tough, rooting stems, which taper underground. There is no partial veil or universal veil (among the North American species, anyway), so the relatively thin stem lacks a ring or a volva. Most of the North American species occur under hardwoods east of the Rocky Mountains, but a few occur elsewhere (see the key below). Over the past century or so the xeruloid mushrooms have been passed around among the genera Collybia, Oudemansiella, and Xerula--and now, after publication of a world monograph of the xeruloids (Petersen & Hughes, 2010), the genus names shift again, rendering Hymenopellis and Paraxerula, among others, for species that were just beginning to feel at home in the genus Xerula (which is now smaller and more limited). Xeruloid mushrooms are frequently encountered around stumps and dead trees--or in urban areas where trees have been removed. They are saprobes that subsist on the wood of dead or dying tree roots, but the mushrooms very frequently appear to be "terrestrial," without demonstrating a clear connection to buried deadwood (which, however, is always nearby). Most of our North American species have been supported by mating studies (see Petersen & Methven, 1994; Petersen & Hughes, 2004), and by analysis of their DNA (Petersen & Hughes, 2010), which makes them species through a trifecta of species concepts: morphological, biological, and phylogenetic. Identification of xeruloid mushrooms often depends on microscopic examination of the gills, cap surface, and spores--and several of the species are dead ringers for one another to the naked eye. This makes xeruloid identification tedious if you don't enjoy microscope work--but if you do enjoy time at the microscope, you'll find that the group presents a nice suite of fairly discreet characters to work with, and a fairly small field of identification possibilities. A Roman aqueduct section, mounted in KOH, is the best choice for xeruloids, since this section will allow you to see all the identification features in one mount. 1. Cap small (7-20 mm across); cap and stem densely covered with whitish to brownish, bristling hairs; in North America limited to Mexico (also found in the Caribbean). 2. Found from the Rocky Mountains westward. 2. Found east of the Rocky Mountains. 3. Growing under redwoods along the West Coast; spores 5-8 µ long. 3. Growing on the deadwood of quaking aspen in various ecosystems in the Rocky Mountains; spores 9.5-12 µ long. 4. Stem (including the above-ground portion) and gills slowly staining rusty brown when handled; gills often developing rusty edges; pleurocystidia capitate; spores lemon-shaped, 13.5-16 µ long, finely roughened. 4. Not completely as above. 5. Cap large (8 to 12 cm across) and brown; stem usually finely hairy (identification on the basis of these features alone should be considered tentative). 5. Cap usually--but definitely not always--smaller and/or paler than above; stem finely hairy or not (microscopic analysis required). 6. 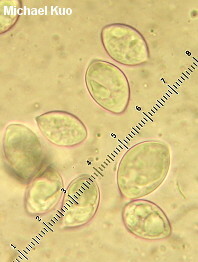 Spores decidedly lemon-shaped, finely dimpled, 18-23 µ long; cheilocystidia capitate; thin-walled, gills of dried specimens turning orange after a few years of storage. 6. Spores variously shaped and sized, but not finely dimpled; cheilocystidia varying; gills not turning orange after years in storage. 7. Spores 9-13.5 µ long. 7. Spores longer than 13.5 µ. 8. Cap honey yellow to mustard yellow, slightly wrinkled. 8. Cap brown to whitish, prominently wrinkled and pitted from center to margin. 9. Spores ellipsoid; stem brown and finely hairy; cap often over 10 cm across at maturity. 9. Spores at least slightly lemon-shaped to flask-shaped; stem whitish to pale brownish; cap usually under 10 cm across at maturity. 10. Spores 13.5-18.5 µ long; pleurocystidia bluntly rounded; thin-walled, hyaline pileocystidia often present. 10. Spores 16.5-21 µ long; pleurocystidia capitate or with large, knobby ends; pileocystidia absent. Halling, R. E. & G. M. Mueller (1999). A new species and a new record for the genus Xerula (Agaricales) from Costa Rica. Mycotaxon 71: 105–110. Pegler, D. N. & T. W. K. Young (1987). Classification of Oudemansiella (Basidiomycota: Tricholomataceae), with special reference to spore structure. Transactions of the British Mycological Society 87: 583–602. Petersen, R. H. & A. S. Methven (1994). Mating systems in the Xerulaceae: Xerula. Canadian Journal of Botany 72: 1151–1163. Petersen, R. H. & K. W. Hughes (2004). Une nouvelle espece de Xerula, Xerula limonispora. Bulletin de la Societe Mycologique de France 120: 37–49. Petersen, R. H. & T. J. Baroni (2007). Xerula hispida and Xerula setulosa (comb. nov.), two similar subtropical New World agarics. Mycotaxon 101: 113–136. Petersen, R. H. & K. W. Hughes (2010). The Xerula/Oudemansiella Complex (Agaricales). Stuttgart: J. Cramer. 625 pp. Redhead, S. A., J. Ginns & R. A. Shoemaker (1987). The Xerula (Collybia, Oudesmansiella) radicata complex in Canada. Mycotaxon 30: 357–405.